will this display compression and vacuum on same screen without having to flip a switch on a snap on vantage? looking for a unit to attach to a snap on Vantage Pro that displays vacuum and compression in case the cylinder goes into a vacuum; so I do not miss out on the critical data that compression is being built but i would also see a slight vacuum when the valve is closed and it should'nt be. thank you? 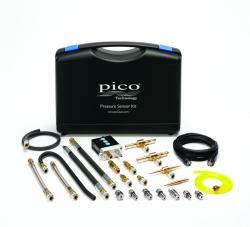 Yes, the Pico WPS can be used with Snap-on scopes to display the data critical to your analysis. However, the Snap-on scopes do not have a preset for the Pico WPS which means the screen will display volts instead of PSI. Sorry, I don't have a screen captured from a Snap-on scope. The screenshot below, from a Pico WPS, shows the exhaust valve opening but the intake valve is not. Note the scaling for the green waveform is +/- 12.5 psi.